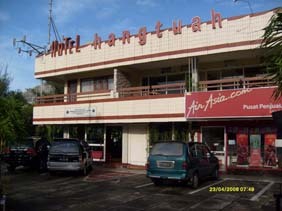 The Hang Tuah Hotel Jalan Pemuda No.1 Padang. A budget hotels located in the center of Padang, just 500m from the ocean. The hotel is close to shopping centres, restaurants, travel agents and internet cafes. The hotel has free WiFi wireless internet access. Breakfast is a choice of Indonesian fried rice or noodles or toast with butter and jam served with coffee or tea. after the too high prices at Immanuel we slept at this hotel. Prices also got up after the earthquake. Standard B + extra bed (= mattress on the floor) was 340.000 Rp. No hot water and in the morning no water at all. Only toast or fried rice for breakfast. They even asked us to pay for the milk in our coffee 7.000 Rp. Location is good but price quality a little sad. I've stayed a few times at the Hang Tuah Hotel. They have very friendly staff and is in a great location close to shops and travel agents. Only a 5 minute walk down to the beach. Have you stayed at Hang Tuah Hotel?